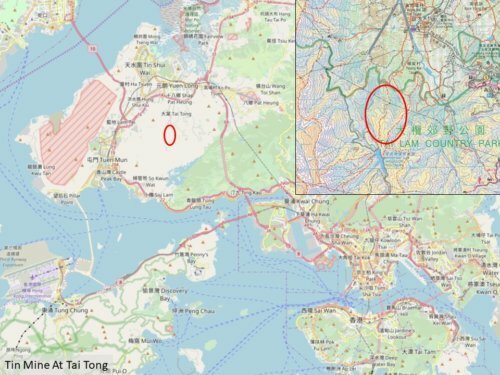 Tymon Mellor: In the previous article on tin mining in Hong Kong, the existence of a pre-war tin mine was identified near Yuen Long but the actual location of the mine was a mystery. 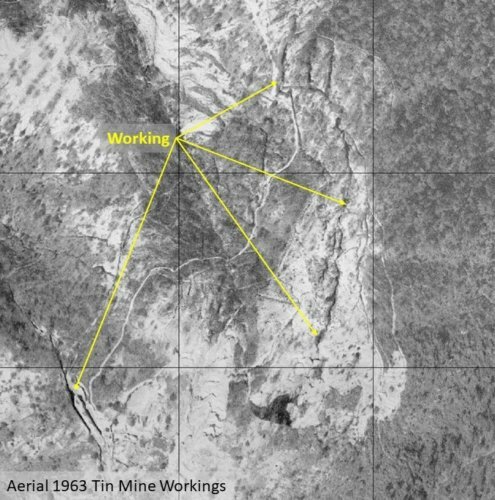 Following further research, new details on the mine and its location have been identified. Following the introduction of the Prospecting and Mining Ordinance of 1906, parties could seek a prospecting licence, a mining licence or a mining lease. This opened up the recently acquired New Territories to the aspirations of the prospective mine owners. Each mining request was registered and a mining lot number was allocated to ensure that there were no overlapping claims. I have not yet been able to track down a full copy of the list, but there were at least 13 licences issued before the start of the Pacific War in 1941. Licence number 13 was for an area of foothills in the Tai Tong district for the mining of tin and wolframite. 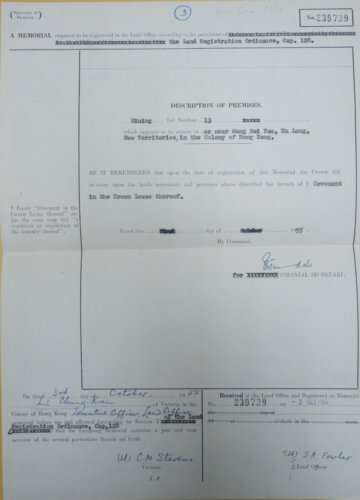 The mining licence was issued by the Governor on the 14th November, 1940 to Mr Lui Yam Suen and Mr Ho Lui Hup in the name of the Tin Shing Mining Company for a period of 21 years. Details of the original application and approval have not been identified. However, the Public Records Office has three files associated with the mining licence. The mining application was approved by the Governor in Council on the 26th September, 1940 based on the standard lease conditions with the addition of a clause to prevent water pollution and to control the health conditions at the mine. 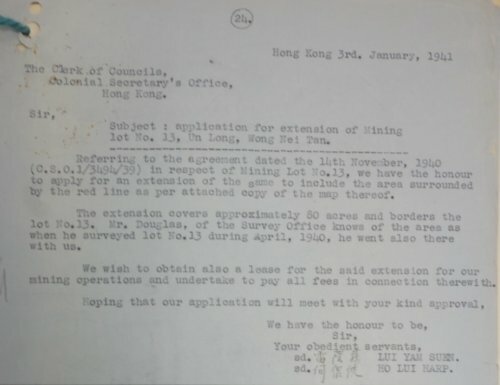 An extension of the area covered by the mining lot for an additional 80 acres was requested by Messrs Suen and Hup on the 3rd January, 1941. The revised mining lease was approved by the Governor in Council on the 1st March, 1941. In November, 1951 there was a complaint from the local farmers that sediment from the mine was blocking drainage channels and disrupting farming activities in what was a fertile valley. The Director of Agriculture, Fisheries and Forests, Mr T G Strangeways paid a visit to the area to see the problems for himself. The mine was managed by a “prominent Hong Kong businessman”, Mr Iau Yam Suen, and was extracting low grade Wolframite ore by panning the excavated ore in the river. This approach resulting in sediment being carried along the river and into the fertile valley for up to two miles downstream. The farmers were producing two crops of good quality rice, and one crop of vegetables such as tomatoes, eggplant and choi a year. Some farmers were also growing yam beans and white cucumber. Siltation of the irrigation systems was disrupting their crops. Mr Strangeways was not a happy man as his memo 13th November 1951 to the District Commissioner made clear, “I know you are perfectly aware of the seriousness of the situation, but feel that I must keep on rubbing it in. To my mind, in a small intensively cultivated Colony, such as we have here, it is a tragedy that mining has ever been allowed on hillsides feeding cultivation areas below”. Mobilised into action, the Superintendent of Mines, Mr W M Keays paid a visit to the mine on the 14th November, 1951, walking the 3½ miles along paddy field tracks from the nearest road from Yuen Long. He noted two mining operations were in progress. Wolframite was being mined in three open pits, with the extracted material being washed through sluice boxes to isolate the heavy ore. The mine operator had set up a pipe line to bring water from 100m higher up the river to power three sluice boxes separating the ore from the native material. Mr Keays was impressed with the arrangement, “This piece of engineering is very ingenious”. The flaw in the process was that the five dams used to collect the washed debris were silted up, resulting in silt passing down-stream into the fields. A tin mine was located near the crest of the adjacent hill in “hard country rock”. The mine started as open-cast, but a subsequent adit had been started to follow the mineral vein. The owner had built a magazine to hold the explosives necessary to excavate the adit. During the visit, the mine foreman advised that no tin mining had been undertaken for “some months”. Mr Keays recorded that the output of ore had “dropped considerably in the last two months”, and he attributed this to the sub-contracting of the work to “Northerners”. Tin Shing Mining Co, care of the Rose Hotel, 30 Nathan Road, was given 14 days to rectify the problems identified. With regard to Mr Strangeways’ comments on mining, the Commissioner of Labour replied on the 26th November, 1951 noting that “I fear that we simply must face up to the fact that while the price of wolfram, tin, lead and other ores remain high and while this Colony is filled with people who are living on the verge of subsistence, it is entirely unrealistic to think that we can prevent the mining of these ores. The most we can hope to do is to prevent it in certain specified areas by rigorous police action and in other areas to control it by insisting on decent mining methods being employed by licenced miners”. clearing of the settling dams. Furthermore, the Superintendent of Mines was not satisfied with the approach to mining being adopted, as noted in the letter to the Tin Shing Mining Company of the 22nd May, 1953 “Full detail as to what machinery you intend installing on your mine, your present scratching methods are not only non-productive but cause a tremendous amount of unnecessary erosion to the hillside which cannot be tolerated any longer. Please note mining is to be carried out only on present modernday standards”. The letter ended with a threat to re-enter the mining lot unless action was taken. Re-entry was the formal process of removing and closing a mining operation and cancelling the mining licence. The company responded on the 24th June, 1953 indicating they had met all the requirements, and considered that the accommodation to be suitable for the 20 men working at the mine. They sought permission to continue mining and to sell the 50 catties (30kg) of ore in the mine store. They had also advised that they had located a new vein of wolframite ore which they wished to mine. The Superintendent of Mines noted in an internal memo of the 11th March, 1955 that the last production figures were dated 20th February, 1953 for 46 catties (27.8kg) of tin and 111 catties (67kg) of wolframite ore while none of the improvement measures had been undertaken. There were no further communications with the mine owners after June, 1953, and the reason for this would not become clear until 1955 when it was discovered that both Mr Suen and Mr Hup had died. Mr Suen outlived Mr Hup and died interstate on the 29th December, 1953 aged 77. The paperwork for the mine was problematic as both owners were dead and despite the approved enlargement of the mining areas from the original 26.29 acres to 109.79 acres, the Government rent had been collected on the smaller value. According to the Superintendent of Mines, mining had ceased in February, 1953, meaning that under the mining licence, clause 9(1), “if in the opinion of the Governor of Hong Kong (whose decision shall be final) the lessees have not been carrying on any bona fide work under this demise for a period of 12 month” the Government could “re-enter” the mine and cancel the mining licence. Discussion with the relatives of the owners provided no clear intent for the mine. Thus, on the 3 October, 1955 the notice to re-enter Hong Kong’s only tin mine was posted and the mining licence was cancelled. The mine today now lies hidden beneath the hillside vegetation. From the footpath you can see indications of the workings, including a concrete footbridge over the excavations. However, most passersby will miss the signs. It is only when you leave the path and explore the woods that you will find the excavations following the mineral vein up the hillside. 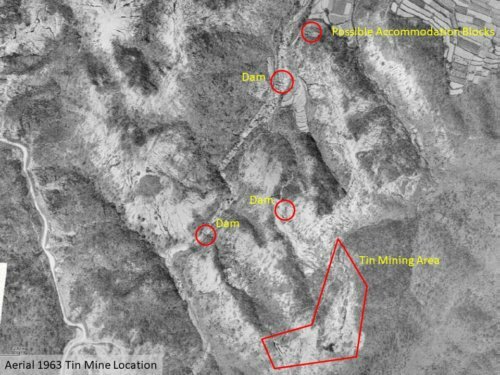 Based on the statements from the Superintendent of Mines that an adit was being excavated using explosives, the miners were likely to be excavating the tin ore cassiterite from a quartz veins within the granite bedrock. However, the exact location of the tunnel portal has not been located. The tin mine in Tai Tong was in production from 1940 to 1953, and appears to have closed due to the death of the two owners. The mine was unique in two ways. It was the only tin mine in Hong Kong, and it was the only mine in Hong Kong where the Government took the action to “re-enter” and cancel the mining licence. 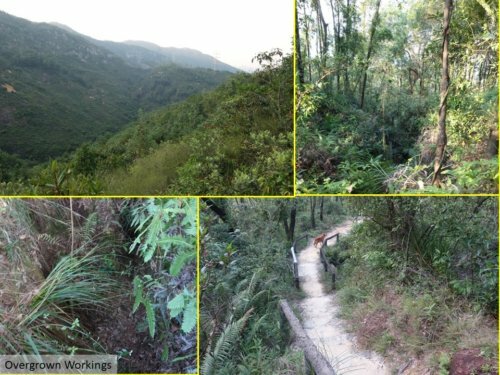 It is unfortunate that this mine story has been lost to time and the workings lost to the vegetation. This article was first posted on 4th November 2017. Tin Mining in Hong Kong? 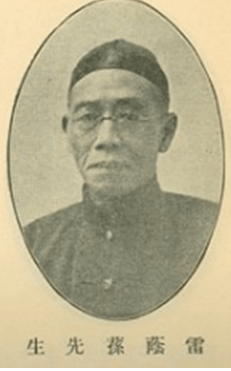 Ho Lui Hup (何侶俠).was a follower of Sun Yat-sen and Hu Hanmin and was a military commander in the revolutionary government in Kwangtung before becoming a businessman in HK. His son Chapman Ho was in the movie business (also married to the actress Lola Young) and was a business partner of the Harilelas in hotel (Imperial Hotel) and securities (Holly Securities). Good afternoon, May I ask how you managed to obtain the information on Ho Lui Hup? I am his great grand daughter and have been trying to locate information on the “Ho” side of the family. I am an architect who worked for the fitting out of a house in Happy Valley, Hong Kong, likely to be built in the 1920s. As I was trying to find out more information about the building, I came across some information that remains, that the first recorded owner was one called 何侶俠, I wonder if he’s your great grandfather.? If so, would you know anything about the history of the building erected on no. 54 Village Road, Happy Valley. Hello Douglas, Yes, he is my great grandfather. Unfortunately I don’t know much about that branch of the family as both my grandfather and great uncle has passed on as well. Sorry. If you have any pictures of the house (interior and exterior) that you could forward, it would be much appreciated. Local Estate sworn under $29200 was left by Mr Ho Lui Harp (or Hap); who died in Hongkong on February 6 1943. Probate has been granted to Li Shui (or Sui) Lan, his widow. Thank you very much for the information. Kind of hard obtaining information when you are overseas and don’t read or write Chinese. I can be contacted via ohsalguod@gmail.com if you have any further information. I will send to you some internal photos later.